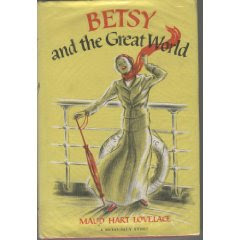 Betsy and the Great World (1952) and Betsy's Wedding; A Betsy-Tacy Story (1955) by Maud Hart Lovelace. Illustrations by Vera Neville. Read original hardcover editions (well, tenth or so printing original!) from library. These two books are being reissued on one volume by Harper Collins, Betsy and the Great World/Betsy's Wedding . The Plot: In Betsy and the Great World, Betsy goes -- alone -- to visit Europe. In Betsy's Wedding -- wait, I hope this isn't a spoiler? -- Betsy gets married. The Good: For the first time, I'm glad that I didn't read the Betsy-Tacy books sooner. Because with these two books, Betsy is firmly in the grown-up world, and for children or young teen readers, that would have presented a barrier. In Betsy and the Great World, Betsy is not in Deep Valley and she doesn't have familiar friends and family around her. (As a matter of fact, we find out that the whole Ray family has moved to Minneapolis!) Lovelace never has Betsy set foot on American soil, except in flashbacks. Great World has all those types of historical details I adore -- not just sailing to Europe and all that an Atlantic voyage involved, but also things like going to a Custom House to get your bags and not needing a Passport for a "mere trip to Europe." Betsy is like the present day backpacker through Europe, except with a heck of a lot more luggage. Instead of hostels, she stays at a pensions and boarding homes. While her parents have arranged for some chaperoning, just as often Betsy is on her own to explore Munich, Germany, Venice, London. And as for her parents -- Betsy has dropped out of college. While her father isn't necessarily pleased with her college career to date, he does not give her grief. He talks to her about it matter of factly -- and offers to take the money that would have been spent on college tuition and expenses and use that to support her visit to Europe, agreeing that the life experiences she will get will be as valuable an education as college. Betsy sails for Europe in January 1914 at age 21; she stays for months until war forces her home. Before that, we see a lost to us old Europe, before the World Wars. A Munich not associated with the birthplace of the Nazis; and because this is written in the 1950s, after both World War I and World War II, I read it as Lovelace's deliberate choice to portray Germans and Germany in a different light. For the most part, Betsy is open to all she meets, to all people and experiences. Oh, she's not perfect about it. When she encounters true poverty in Algiers, she is scared and put off by the anger and hostility that goes along with poverty. Once in Munich, alone, she is lonely for the first time in her life and has trouble adjusting, realizing for the first time that making friends doesn't just happen. I have a Ramona-ish confession. I always wonder about toilets and bathrooms. Lovelace, of course, does not share terribly personal toilet details; but she does share the lack of a bath! In Great World, Betsy does not have access to a bathtub. While she wants one (understatement of the year, no doubt) she never mentions lack of immersion bathing leading to herself (or others) being smelly. And one of Neville's illustrations of Betsy bathing is quite revealing! Betsy's Wedding is about the first few years of Joe and Betsy's marriage. The book begins in September, with Betsy's return from Europe and ends a few years later, as Betsy's husband and the other young men she knows prepares to leave for World War I. If Betsy and the Great World is one of my favorite Betsy books, Betsy's Wedding is, so far, my least favorite of the series. Tho, saying that is misleading -- it's like saying Mint Chocolate Chip is the last favorite of my favorite ice cream flavors. I love Mint Chocolate Chip! It's just not Coffee. This last, final book of Betsy's life has some great stuff. We see glimpses of many of the people we met and fell in love with in Betsy's life: Tib and Tacy, of course, as well as the fabulous Rays, but also Carny and Cab. What else is good? Mr. Ray's common sense insistence that Joe have a job before he and Betsy marry, so Joe taking something other than his dream job. Finding out that Joe makes $155 a month and Betsy's budget allows for no more than $30 a month for rent. Think about this; it's less than 20% of his salary. And they get a one bedroom! Betsy's adventures with cooking are intriguing; one could easily find articles today complaining about how today's kids aren't being taught to cook for themselves and what will happen when they are out on their own. Betsy's family, while not rich, do have a full time housekeeper/cook; but, we've seen both Mr. Ray and Mrs. Ray cook and bake. Betsy even had "domestic science" in school. Yet, Betsy's first attempts at cooking are not until she's married and in her own apartment, and, oddly enough, I kept on thinking of Julia Child, especially as Betsy is proud of serving canned peas and marshmallow pie. Betsy's cooking successes and failures are the same of many today, in their first kitchens, cooking for themselves. Other wonderful details include Betsy and Joe getting a cleaning lady for help with the big stuff; Joe supporting Betsy's writing; Betsy supporting Joe's night shift job by adjusting her own hours to match his. The peak into the life of twentysomethings in the early 1900s. So what is it that made this my least favorite? Well, out of a series ONE has to least, right? Part of it is all the young marriages. Tacy and Betsy discuss Tib not being married, and instead working and wanting her own car. Tacy: "When girls don't marry young, they get fussier all the time." Betsy: "And Tib will soon be earning so much money that she won't meet many men who earn as much money as she does." Tib: "That would be bad." Betsy: "And then she'll start driving around in her car, and getting more and more independent, and she won't marry at all, maybe! And then what will she do when she's old?" Don't worry! Tib gets married by the end! Don't you worry about that money and independence and fussiness! And then, all the husbands go to war, all the High School boys are in uniform, with a patriotic wedding, shiny uniforms, three month officers, as if going on a great adventure. And you know? Reading this while listening to Maisie Dobbs? I wonder at the pure enthusiasm Lovelace is able to muster to write about a war, given that she saw Europe before, saw not one but two World Wars, and -- I would think -- had seen the loss of war. I wonder, is this the difference between the English experience and the American experience? Did Lovelace see those boys and men return, uninjured, so her book doesn't reflect, even as a shadow, the despair and death and waste of a generation? And so, the two reasons I don't like the book? Have nothing to do with the book itself. 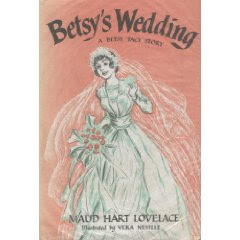 I haven't yet read The Betsy-Tacy Companion: A Biography of Maud Hart Lovelace ; but I know that Lovelace and her husband, Delos, didn't marry until 1917, three years after Betsy and Joe. I have no idea what her experience with the war was. In a way, I can understand why Lovelace made these changes; these books are fiction, after all. And it is her story to tell, and Betsy's Wedding does end on a moment of happiness and contentment, with the three girls together as women. Perhaps Lovelace didn't want to cast a shadow on the joy of these three, even if the reader knows the shadow was coming. Maybe I am being too much a reflection of my times, in not understanding Lovelace's portrayal of the war. Now, off to track down the Carny and Emily books and to read the Companion! Wonderful post! I see MHL's portrayal of the prelude to war in Betsy's Wedding as being akin to her portrayal of a pre-war Germany in Betsy and the Great World. I suspect that her portrayal of the enthusiasm with which those boys entered into it is true to the way that they would have done so before they really knew what they were getting into. Depicting it laced with the fear and horror of of someone who knows how it all turns out would have been the distortion rather than the reverse. MHL had orignally planned another volume in the series, Betsy's Bettina, but ultimately found herself unable to write it. That book would have had to include first-hand experience of the horrors of WWI and would have dramatically changed the tone of the series. And so, although I would love to have another book in the series, I can't help but think that she made the right decision in concluding it when she did, leaving it as a bit of a time capsule and a tribute to a more innocent time in her life and that of her characters. I agree with Kate, but I'm glad we at least got to know that there was a little Bettina! I loved that bath scene in GREAT WORLD, the handsome soldier, the conspiracy of the other residents. Oh, and the Italian romance! How could she have resisted Marco? I have yet to read a single Betsy-Tacy book, and after all your reviews, Liz, I'm going to have to do something about that. Don't forget Winona's Pony Cart! It takes place between Over the Big Hill and Downtown. I know these books are fiction, but I'm really looking forward to the Biography to see what is "real." And right now i envy the people who will read Betsy for the first time. They are quite the treasure, and I cannot think of a recent (past 10 years) children's series that does this, the historic look at childhood over multiple books and child aging based on author's own childhood. I came across your site whilst looking at someone elses and I am so glad I did. I have never heard of these books and after reading your post, I am desperate to read this series of books. Hmmm. Now I'm curious. I need to look for these books at the library! The things the characters say about marriage doesn't bother me too much, since I expect that's the way people honestly saw things back then. Expectations were different. Still, I'm glad we're not tied to that one anymore. Having read the Companion and seeing that Maud & her friends married in their mid twenties and later, I wonder if the quotes that bother me are meant tongue-in-cheek and perhaps are an inside joke, as well.